Pettistree Carpet Bowls was founded in 1994 after a small group of villagers watched a game being played at an inter-village Sports Day organised by Suffolk Coastal District Council. They discovered the sport was suitable for all ages. After a demonstration, a successful grant, the loan of equipment and fines for poor play, twelve residents gradually became adept at the game. The size of the Village Hall prohibited the group joining a league as two mats are required and there is only room for one. However, enjoyable and friendly competitive evenings are arranged with neighbouring villages and the village is represented at Sports Days at various venues in the County. 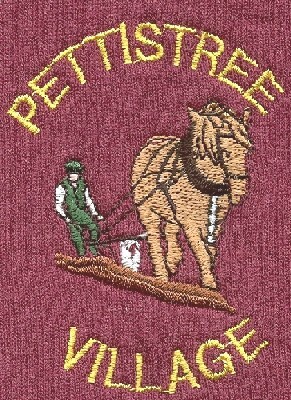 Pettistree is easily recognised on these occasions by their maroon sweatshirts with logo of a ploughing horse. Al are welcome to come and have a game, there is no membership fee but a very small charge is made to cover refreshments and heating.